burdened with the harvest of sorrow. 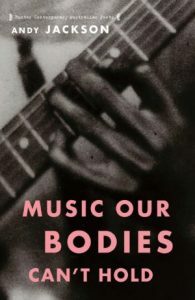 Andy Jackson’s Music Our Bodies Can’t Hold comprises a collection of “portraits” of people who have Marfan’s Syndrome. Some of the portraits derive from interviews Jackson undertook himself, and some address historical and public figures and are creative extrapolations of available biographical and autobiographical data. The latter include poems on Abraham Lincoln, the already-mentioned Sergei Rachmaninov, Mary Queen of Scots, and Osama Bin Laden. Although in many cases there is no actual diagnosis available for these historical portraits, Marfan’s range of distinct physical symptoms including extremely elongated limbs, large hands and other markers, in combination with Jackson’s intimate knowledge of the condition, make these pieces far more than someone just drawing a long bow. In the context of Jackson’s work, things seem slightly in reverse here; this might well have been a book in which Jackson began his poetic exploration of Marfan’s Syndrome rather than being well along in his poetic career. 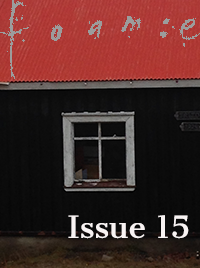 It seems like a more broadly foundational work – looking outwardly and connecting to a community, instead of an individual speaking inwardly – than 2013’s The Thin Bridge (Whitmore Press). But in combination with Jackson’s collaborative theatrical production, Each Map of Scars, this new book signals the development of a larger body of work which, though it has at its heart an effort towards raising awareness, mostly does this within the significant framework of first-person testimony. While the book is divided into two twenty-three sections, “23 Chromosomes”, together with a Prelude, Interlude and Postlude to round out the secondary musical theme, it is interesting that the book mixes its public figures with its everyday people. Arrangements such as this do tend to trigger my tertiary creative writing nerves (as I know the administration of these projects regularly imposes the need for clear structural plans that grow a bit stale as the true work evolves) but then again this has turned out to be a very clear and pleasurable structure to move through as a reader. My throat wrapped in bandages. in the water of my own body. and I wish to God they wouldn’t. Incarnation is no burden. I arrive when the genetic stars align, optimistic every time. At first, their lives are mostly short, broken sentences. I love each one, dumb with pain or suffused with light or both. I love this eerie personification, which in theory could be regarded as a noticeably contrived idea, but Jackson brings it across with real, dramatic poise and it is especially impressive in a work of poetry that switches characters every couple of pages and is based on real people. To have this imagined persona speak with such authority and tenderness is to then highlight how the spirit of this voice infuses, to varying extents, the bearings of those with Marfan’s Syndrome, the voice truly portraying the condition and its residence and vigilance within it hosts’ bodies.